Victoria Day is a statutory holiday in Canada and falls on the last Monday before May 25th. This year, the Victoria Day long weekend is May 18-20, 2019. Most people in Canada consider the Victoria Day weekend the real start of summer. The problem is that it's often still pretty cold for the first long weekend of summer. Still, chances are good the weather will be nice enough to be outside, even if you may need a spring jacket. This is why gardening, camping, patio-lounging, fireworks, and other outdoor entertainment are all popular choices over the Victoria Day long weekend. Not only that, there's always a lot going on in the city over this pre-summer long weekend, from fireworks to festivals. If you're new to Ontario you should know this weekend has another name — one which has very little to do with celebrating royal birthdays: May Two-Four weekend. A "two-four" is slang for a case of 24 beers, and since the Victoria Day weekend often ends up including the date May 24th, well, the "May Two-Four" is that weekend where you have an extra day to drink or recover — however you want to look at it. In the hopes that the frost is really over, many people break out the gardening gloves for Victoria Day and get dirty. If you're one of them, visit a nursery like Sheridan or Evergreen Garden Market at Evergreen Brick Works to get the plants you need (just don't forget to check their hours, first). Many grocery and department stores also have garden centers open for this weekend for all your planting needs. If you aren't able to make it out to Algonquin Park or other further campground or provincial park, consider the Glen Rouge Campground in Rouge Park. Toronto's only campground may not be as rustic as heading up north, but it also won't cost you nearly as much in gas. Here are some of the places where you can usually see fireworks on either the Sunday or Monday of the Victoria Day weekend. Please note that some of these events are weather-permitting and subject to change from year to year, so it's best to confirm closer to the date. Fireworks at Canada's Wonderland: The giant theme park just north of Toronto usually offers a fireworks display at approximately 10 p.m. on the Sunday of Victoria Day Weekend. The show is included with park admission. 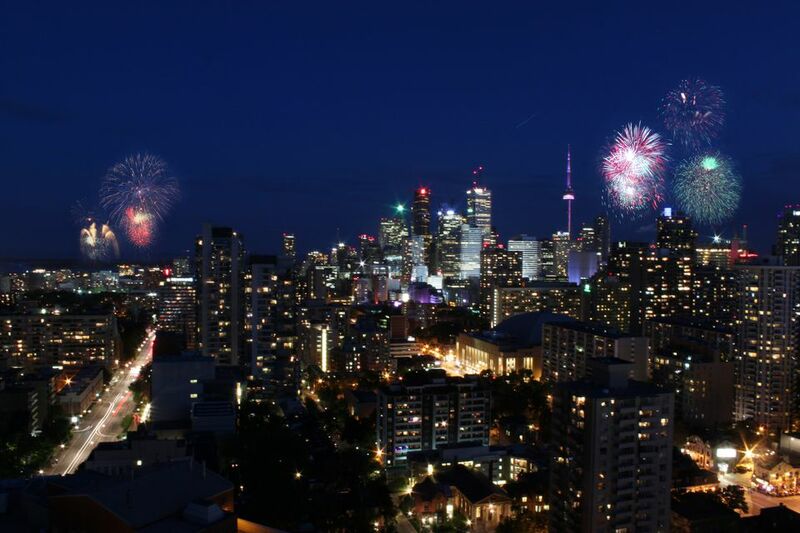 Fireworks Display at Ashbridges Bay: Head to Ashbridges Bay Park (south of Lakeshore Road East and Coxwell Avenue) for the annual Victoria Day Monday fireworks. The show usually starts around 9:45 p.m. and lasts about 15 minutes, but head to the Beaches neighborhood early to explore and get a good seat! Head down to the historic Distillery District for this arts and craft show taking place throughout the Victoria Day weekend for 2019. Stroll the Distillery's cobbled streets and browse jewelry, clothes, art, photography, sculpture, and more courtesy of a curated selection of 80 artists from across Ontario, Quebec and beyond. While this event doesn’t fall on Victoria Day, the festival does culminate over the long weekend. Head to Young-Dundas Square in downtown Toronto to get your fill of BBQ and craft beer. Happening May 16-19, 2019, Rib Fest features some of the best rib teams in Canada showing off their skills. In addition, wash everything down with beer from numerous craft breweries. If you've got kids, this fun festival, now in its second year, is happening May 18-24, 2019 and includes a whole host of kid and family-friendly events featuring free and ticketed activities like theatre and performance art circus, storytelling, music as well as great food. In addition to taking part in events and activities right in the city, the Victoria Day long weekend is also a great opportunity to do some exploring beyond the city. There are several small towns within an easy drive of Toronto that offer the chance to experience some serious small town charm. Dundas, Niagara-on-the-Lake and Port Hope are just a few fun options to choose from. Photo buffs take note. Founded in 1997, Contact is the largest annual photography event in the world, happening from May 1 to 31, 2019 featuring over 200 exhibitions. Expect works by artists from Canada and around the world presented at established galleries across the city. Since the weather is usually conducive to being outside during the Victoria Day weekend, why not lace up you walking shoes and do some exploring on foot. Toronto is filled with unique neighbourhoods and urban walks well worth discovering, from the scenic West Toronto Railpath to Kensington Market and Chinatown.